TEHRAN, Iran (CNN) -- A former Iranian president who backed the top opposition leader in last month's disputed elections has delivered strong and carefully worded support of the grass-roots protest movement, saying he doubts that "any wakened consciousness would be satisfied with the resulting situation." 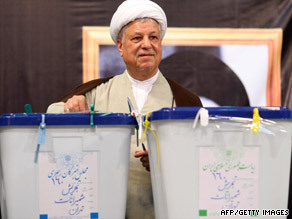 Ex-President Ali Akbar Hashemi Rafsanjani, here voting in Iran on June 12, says trust has been eroded. Former President Ali Akbar Hashemi Rafsanjani, chairman of Iran's Assembly of Experts and a supporter of opposition leader Mir Hussein Moussavi, was quoted Saturday by the semi-official Iranian Labor News Agency. Rafsanjani, who heads the group responsible for appointing or removing the supreme leader, was silent and largely unseen during the first two chaotic weeks after the contested June 12 elections. But Rafsanjani -- a key politician in the Islamic republic -- has become increasingly vocal about the elections results that gave hardline incumbent President Mahmoud Ahmadinejad an overwhelming victory. Last week, Iran's election authority, the Guardian Council, said it considered the election outcome a closed case. "People from across the country participated in the elections, with excitement," ILNA quoted Rafsanjani as saying in Saturday's story. "But unfortunately the events that occurred after that and the difficulties created for some left a bitter taste, and I don't think that any wakened consciousness would be satisfied with the resulting situation." He referred to the recent expressions of opinions across the country regarding the election crisis as a reflection of a power struggle "at the highest levels of the system." "I hope that with proper management and fortitude, in the next few days, we can be witnesses to the betterment of the situation, resolution of the difficulties and the decrease in the number of the families waiting for their loved ones," Rafsanjani said. "We must think about safeguarding the long term interests and benefits of the system." While the protests over the election results mostly dissolved last week, those dissatisfied with the system continue to chant "Allahu Akbar" -- God is great -- from the rooftops in Tehran. Based on amateur footage viewed by CNN, the nighttime chanting went into its 21st consecutive day Friday.